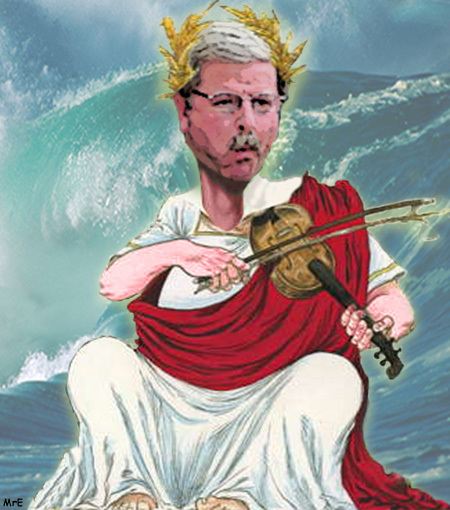 Fiddler on the Wall - Mayor "doesn't care"! A stormy city meeting on Monday 14th April centered on the threat to our safety posed by the replacement lower flood wall, a stolen election and the possible illegal sale of city property in the form of topsoil. In other words, business as usual for the Persing Administration. Persing’s considered response to all of this? – “I don’t care”! Julie Brosius was so angered by recent revelations from Jim Eister, confirming that Persing had concealed from the people of Sunbury the fact that the WPA wall had failed inspection in 2011, that she climbed out of her sick bed in order to confront them both. In her election flyer, Julie had stated that Sunbury’s flood defenses were compromised. During the flood of September 2011, 4 sections of the historic WPA Wall totaling 675 square feet, were blown out. The Army Corps of Engineers had estimated repair costs of $30,500. They stated that every effort should be made to return the damaged elements back to pre-disaster conditions incorporating the wall’s historic nature, design and build. A grant was available from the Department of Homeland Security to pay for the work. However, the City sat on its collective thumb, and Julie warned that their inaction endangered the safety of our city, and that another flood could lead to a failure of our defenses. There could be no doubt in anyone’s mind that Julie was referring to the WPA Wall – her flyer even included a photograph (below) clearly showing one of the damaged areas. However, in his determination to cling to power, no matter what it took, Persing set out to mislead the electorate. He admitted during the meeting that he had concealed information that the WPA wall had FAILED its inspection in 2011. 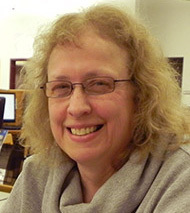 Julie Brosius was derided and discredited by his claims, both in the Daily Item and also on WKOK, that the wall was in excellent shape, and had received exceptional ratings following its inspection. However, he was disingenuously referring to the main flood wall, and not the WPA wall. Julie told us that by his underhand actions just before the primary election in concealing the true facts of the situation from the people of Sunbury, Mayor Persing had, in her opinion, cheated his way back into power. Why Replace the WPA Wall? 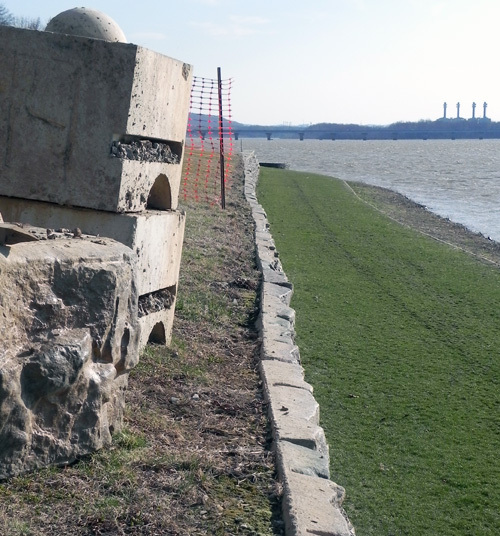 For almost 80 years, the historic WPA wall has ably protected our city from the ravages of the Susquehanna. Now it is gone, reduced to a pile of rubble. So what are we getting in its place? According to the Elk’s Citizen of the Year, Councilman Jim Eister, we are getting the finest wall that (a lot of) money can buy. Unfortunately, as with so many other things in our city, appearances can be very deceptive. A recent visit to the construction site for the new outer flood wall, aka Sunbury Riverfront Project Phase III, provided a chilling reminder that the same dysfunctional team who brought you security cameras which can’t see in the dark are also responsible for this project. We were horrified to observe that the wall was being built on a base consisting only of crushed limestone sitting on top of nothing more substantial than the mud and rocks of the river bank. 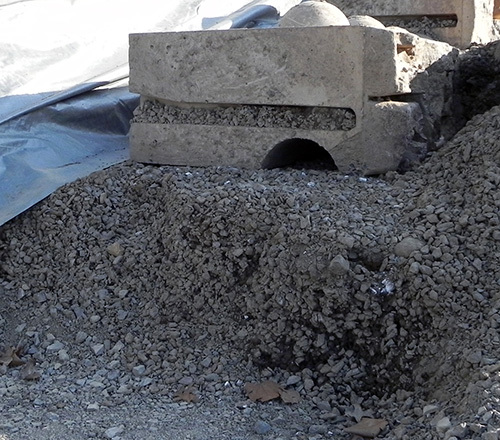 According to the Redi-Rock manual, any such unsuitable base material should have been excavated and replaced. Eister explained that many engineers had looked at this project, including ones from the Army Corps. However, when we called the local Army Corps office in Danville and explained the construction techniques being employed, they told us that this is not how they would have approached the project. We will talk more about this in our Redi-Rock Case Studies section below. Wall Foundation – Crushed Limestone! When asked to justify the $394,000 cost of building a new wall against the $30,500 fully grant-funded cost of repairing the historic WPA wall, Eister claimed that the $30,500 was only for “engineering work” and that it would cost considerably more to repair the wall. When confronted with the grant documentation, he withdrew this statement and apologized for misleading the City. When asked a further question about the cost of the wall – the fact that the original estimate dated 8th January 2013 was for $391,000 for 675 feet and now the actual bid for the present work is for $394,000 for only 400 feet – an almost 60% increase in the cost per foot, Eister simply stated that the first price was an estimate and the second price was the actual bid. We have looked at this in every conceivable way, and simply can’t understand how it is possible to have the wrong size but the correct price on an estimate. Serious questions arise from this – especially as the City did not solicit any competing bids for this major project. In order to finance this work, the City is going into debt. Even with the inclusion of $100,000 from the Municipal Authority and an increase in the FEMA Grant to $50,000, they have still needed to borrow almost $250,000 from the Northumberland National Bank to cover the shortfall. Was this contract awarded in a competitive bid situation, or was it given to the bank at whatever rate they were prepared to offer? This was all done on the pretext of avoiding repair costs of around $30,000 every 14 years. Do the math. The cost of the new wall would finance the cost of WPA Wall repairs for well over 100 years. This, of course, is in the unlikely event that the new wall itself will not require any major repairs during that same period. When asked about the timing of the work, Eister had previously told the City meeting on 2/24/2014 that it was due to commence this fall. However, the contract documents clearly show a completion date no later than 6/6/2014. Deadline for submission of bids had been 12 days previous, on 2/12/2014. Why did Eister feel it necessary to mislead the meeting in this way? Why are they even doing this work at a time of year when, historically, there is an increased likelihood of flooding? When asked about the possible sale of top soil from the site – soil which has been described to us as premium alluvial soil of the highest quality – Eister said that the soil had only been moved temporarily and would be returned later. The picture below shows the final destination of several dump truck loads of the soil, some 10 miles outside the city. 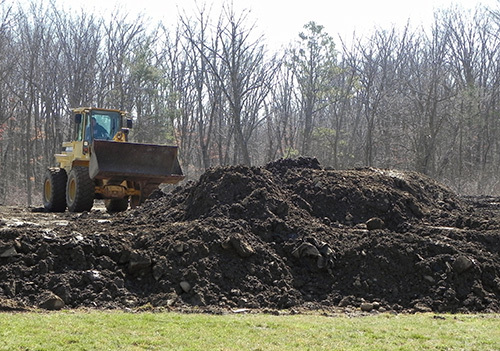 It does not appear to us that this property owner has any intention of returning his soil using, as he was, his front loader to level off his new yard. Topsoil from Wall Project is now part of Someone’s Yard! So far we know of two locations where the soil has been taken – the second recipient appears intent on selling it to local gardeners and landscapers. A Right To Know request has been filed to establish if any official documentation exists for these transactions. For Mr. Eister’s elucidation, there is no place to which the soil could be returned even if, by some remote chance, that really was his intention. 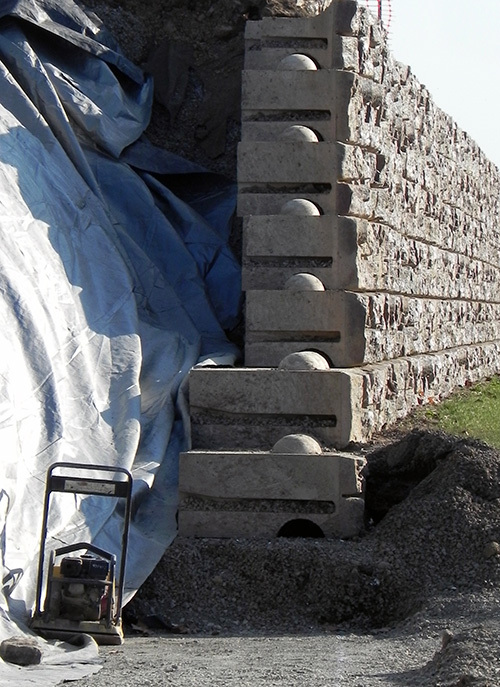 The Redi-Rock design manual specification for retaining walls, in order to facilitate efficient drainage, calls for this structure to be back-filled with stone. When asked about the stone removed from the WPA wall, the value of which can be conservatively estimated at $40,000, Eister said that it was to remain on site. We are closely monitoring the site for any change in its disposition. There are still many unanswered questions surrounding the construction of this wall. The partnership of Buchart Horn and HRI, working closely with Jim Eister, was responsible for phases 1 & 2 of the Riverfront. Their work on this project was featured on the company calendar and also on the Redi-Rock Website. This time around they seem to have received the work with little or no opposition. Certainly theirs was the only bid received. Was this because no other contractor was interested in a $400,000 contract or was it for some other reason? Something else which could be worthy of investigation! Why is the new wall being built on a base of crushed limestone? Of all the materials that could have been chosen, limestone is the one most likely to be dissolved by the cocktail of fracking and other chemicals which nowadays grossly pollutes our river. Also, according to the Redi-Rock design manual, this method of construction is recommended for use on dry land. There appears to have been no account taken for the fact that this base is located many feet below river flood level. Redi-Rock blocks are manufactured from concrete. How is this material going to stand up to the river pollution mentioned above? Certainly it will never compare to the stone used in the original WPA wall, which has withstood the test of time. During a recent conversation with Municipal Authority director Dan Ramer, one of our associates questioned him about the dangers to the main flood wall posed by excavations being carried out within 16 feet of the wall’s base. We were told that such work was only undertaken with the approval of the Army Corps. He was, however, more concerned to learn of possible damage to the main wall caused by the close proximity to it of heavy equipment. 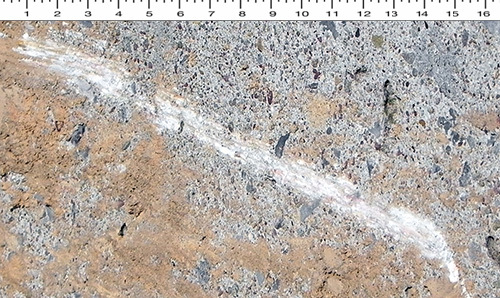 We noted a number of abrasions on the wall’s surface, and Mr. Ramer agreed that it was impossible to rule out internal damage to the wall’s structure caused by such apparent carelessness on the part of the contractor. Contractor Damage to Flood Wall. Scale in inches. Stabilizing Storm Water Drainage System to stop erosion in a Kentucky Neighborhood. The designs called for a reinforced concrete footer to act as the base of the wall. On top of the concrete footer, two courses of 60 in. deep Redi-Rock bottom blocks were installed, followed by 41 in. deep Redi-Rock blocks for the rest of the wall. The paramount consideration for the wall solution was what to do about the base of the retaining walls to prevent the river from undermining it. Michael Johnson, PE and President of Civil Solutions Group determined that the most effective solution would be to use sheet piling at the base of the walls. To create a foundation for the retaining walls, Engineers Construction designed and excavated the ledge to reshape it using mechanical devices and blasting. Then, they installed rock anchors into a 700 cubic ft. concrete leveling pad. The rock anchors extended 6 ft. into the ground at intervals of twelve inches for the entire length of both walls. There are many more case studies on the Redi-Rock site, but the 3 quoted above show why we have such major concerns about the engineering design for this project. All these case studies emphasize that the strength of Redi-Rock walls, as with all structures, is largely dependent on the strength and stability of its base. In all 3 cases the engineers went to great lengths to insure the base was adequate to support the weight of the wall. None of them built on a base of crushed and compacted limestone – not even the power plant walls, which were located well above the flood level of the local river system. For the reasons already stated, we do not believe that the new wall is in any way an adequate replacement for the WPA Wall – a wall which has successfully withstood the passage of time and a wall, given a little regular care and attention, something which the City had abjectly failed to do, could have been around for another 80 years or longer. Mr. Eister told us on Monday night that they were using exactly the same construction methods as had been used for the previous walls, built during the original Riverfront Project. Perhaps this explains why these walls, after only 3 years and 1 flood cycle, are already badly out of alignment, a fact which does not augur well for their longevity. Only 3 years old and already showing serious signs of wear and tear! In the event that the new wall is undermined by the River and washed away, how would this affect the safety certification of the main flood wall and, consequently, the levels of flood insurance premiums, if such insurance was even still available? Also, what kind of damage would the impact of 1 ton concrete blocks have on the Fabridam, and on the very future of Lake Augusta, upon which so much of our local recreation and tourism depends?